We all started somewhere. And in this article I want to talk to you about beginner mistakes. 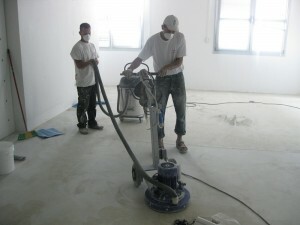 Mistakes that I personally have been involved in, mistakes that I am seeing commonly caused by newbies in the area of resinous floors. Mistakes that can easily be avoided if we only asked the right questions and did some background research when we first started. The problem is if you don’t properly go through the surface prep phase you will face all sorts of problems afterward. Problems could be adhesion and peeling, surface defects, visible cracks etc, the list goes on and on. Not properly sealing the slab– Bubbles and pinholes can emerge for many reasons and it is beyond the scope of this article to go into all the reasons. But perhaps one of the most common causes are porous slabs. That release trapped air when they they are coated over. Ensuring that the slab is sealed and well primed is a great way to reduce the risk of bubbles appearing. Not understanding epoxy chemistry. Many people working with epoxy for the first time may have a background in other fields like painting, waterproofing or concrete. Often they will enter epoxies with a rather complacent attitude. For example a common mistake I see among beginners is not understanding how two components systems work. I see many mistakes when mixing the epoxies (Read this article for common mixing mistakes) I also see some workers not having a sense of urgency when it comes to understanding the limited potlife of an epoxy resin compared to other products. Concluding I just want to say no matter how many years you have been involved in construction always adopt a novice attitude when entering a new field or an unfamiliar project. I have seen far too many old school professionals give the “I’ve been working 25 years in construction speech” only to cause a major mess-up a little later. I once had a worker insisting on wetting the concrete before applying the epoxy! So now I would like to hear your feedback. What mistakes do you see happening amongst beginners? What mistakes did you make when you first started out?